Ed, Emma, Lee, Leo, Jay, Kerry, and Clifton at the National Masters Indoor Championships. 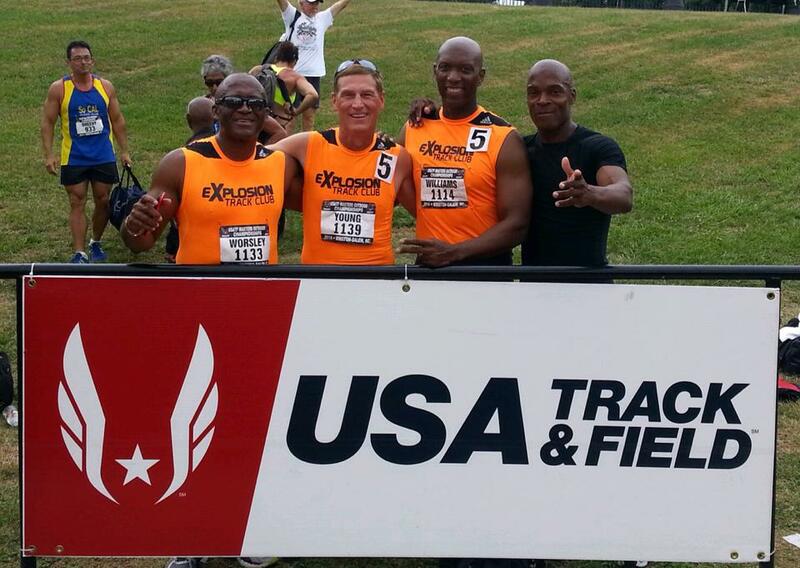 Explosion Track Club traveled to Winston-Salem, North Carolina for the USATF Masters Indoor Track & Field Championships. The 2015 edition of the three-day meet was contested at JDL Fast Track. Explosion club members wasted no time, turning in impressive performances on the first day of the meet. Emma McGowan, Lee Bridges, Jay Williams, and yours truly, Ed Rhyne, all competed in the 400 meter dash. All four members placed, with Emma and Lee winning gold, Jay placing 6th, and yours truly winning silver. Day one action also included Kerry in the pentathlon. The multi-event competition, including 60 meter hurdles, long jump, shot put, high jump, and 1,000 meter run is a grueling display of speed, strength, agility, and endurance. Kerry ran, jumped, and threw his way to 3,196 points and a silver medal. Day two action featured Leo Worsley and Emma in the 60 meter dash and Kerry in the 60 meter dash and the 60 meter hurdles. Leo ran a near-personal record (PR) of 8.03, but narrowly missed the finals, placing 9th. Once again, Emma sprinted to victory, earning another gold. Kerry didn’t advance to the 60 meter dash finals, placing 14th, but he captured his second medal in the 60 meter hurdles earning the bronze. The final day of the meet included club members running the 200 meter dash and the 800 meter run. Lee won silver with a PR of 23.34 and yours truly earned bronze with a PR of 24.06. Leo placed 12th and Jay placed 14th. Once again, Emma ruled the day winning gold and securing the sweep. The performance was a team effort. Five out of six Explosion club members contributed to the team point total. The team scored 59 points to place 19th out of more than 80 teams. Congratulations everyone. Emma, in the orange top and black shorts, rounds the turn at the Reggie Lewis Center in Boston, MA. Emma McGowan traveled to the Reggie Lewis Center in Boston this weekend to participate in the USATF Indoor National Championships. Emma ran in the Masters Invitational Program 300 meter dash. The Masters Invitational Program showcases exceptional athletes aged 40 and up. These events take place at premier track meets across the United States. Winning silver in Boston is cause for celebration, but Emma has her sights set on her next big meet--USATF Masters Indoors Track & Field Championships. Emma will travel to Winston-Salem, NC March 20-22 to compete in the 60 m, 200 m, and 400 m dashes at the national championship meet. Recently, Mike Young and Explosion Track Club have been getting some ink. No, they didn't go out and get tattoos to celebrate their recent accomplishments at the USATF Masters National Championships. They appeared in the local digital news. For an article on Mike and the USATF Masters Nationals, visit AdvantageNews.com. Visit RiverBender.com to read about Mike and his experience as a Senior Olympian. The Beast Squad Boys and Beast Squad Divas arrived in Winston-Salem, North Carolina with big plans. The main goal was to set new PRs. The next goal was to reach the awards stand. However, we didn't forget that most of all, we wanted to have fun doing it. Following, are just a few highlights from the four days of competition that took place at Wake Forest University's Kentner Stadium. Lee Bridges wowed the crowd with a double victory in the 200 m and 400 m dashes. Newcomer to USATF, James Birgans, placed 2nd in the 100 m, leaving no doubt that he will contend for future championships in the premier event. Rashida Gates showed no fear in the 400m, taking an early lead around the curve and through the backstretch. She hung on for 3rd place, achieving a personal record of 62.99 and All-America honors in the process. She also ran a stellar leg of the 4x400 m non-club relay, helping her team win silver. KS and Jay Williams achieved All-America honors in the 400 m hurdles, with times of 65.04 and 66.28. The team performance of the day belonged to the M50 4x400 club relay team of KS, Mike Young, Jay Williams, and Leo Worsley. 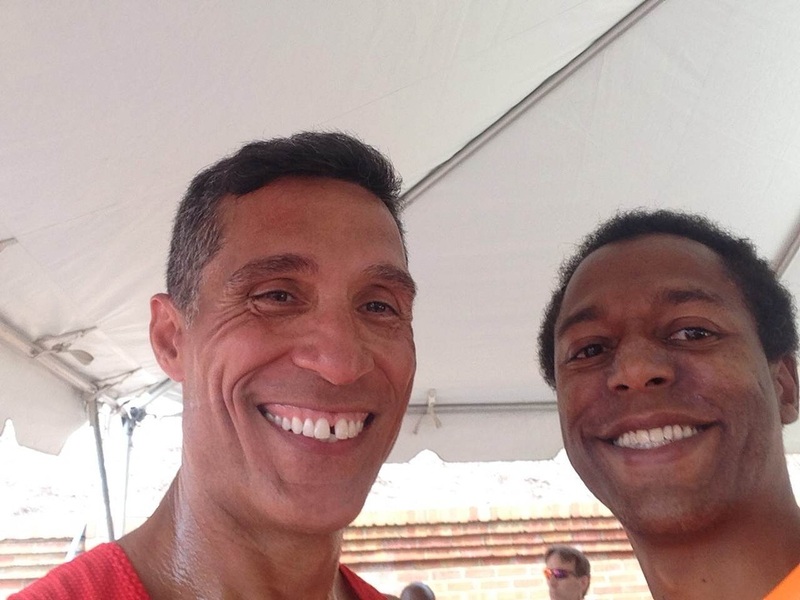 Kudos go out to Mike Young, who hadn't run a 400 m in over 30 years! He ran a tough lap on an injured foot, replacing an also injured Birgans. Every team member contributed to the team's 63 point total, helping Explosion earn the 24th spot out of more than 100 teams. One member of the Beast Squad, however, shouldered the bulk of of the load. Beast Squad Diva, Jossette "Josie" Hobbs snagged two personal records and three All-America honors, en route to three silver medals and 18 team points! She won silver in the 100 m, the 200 m, and the long jump. The team had a great time, setting new personal records and meeting friends new and old. One of those new friends is Jonah Silva, a member newly recruited by Peirre Williams when they were both at the USATF National Club Championships in Tacoma, Washington. Jonah participated in the 800 m as an unattached runner, placing 6th. He also ran a leg of the 2nd place 4x800 m non-club relay with yours truly. Next season, Jonah will compete as a member of the growing Explosion Track Club family. Welcome Jonah! Explosion Track Club traveled to Waukesha, Wisconsin for its final meet before the national championships. Coach Jamo's Beast Squad recorded several personal records (PRs) en route to capturing both the men's and women's team titles. Though fun, the day was about more than just recording PRs and winning gold. By capturing team titles, Explosion was awarded a $600 travel reimbursement grant for the Club National Championships! Next up for the team is a pair of national championships later this month. Pierre will travel to Tacoma to participate in the Club National Championships. On the opposite coast, the Masters athletes will compete in the USATF Masters Outdoor Championships in Winston-Salem, North Carolina.